How much higher should interest rates be? Reasonable people can disagree about whether stocks are overvalued, or whether the Fed's massive QE purchases of bonds have distorted interest rates and asset values. 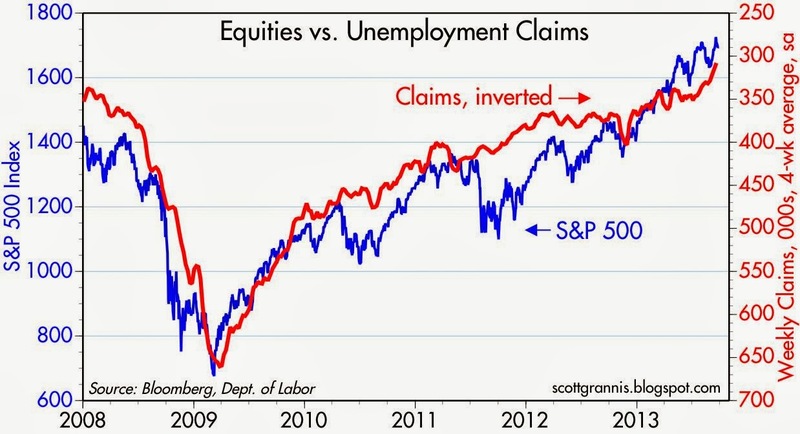 I'm on record as suggesting stocks are attractive and QE hasn't artificially stimulated the economy or the markets. 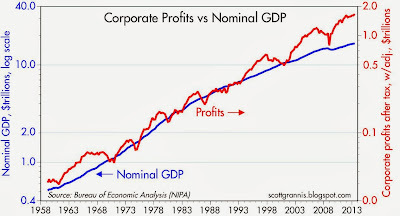 With that in mind, I offer a collection of charts that show how the behavior of stock prices has been commensurate with various measures of improvement in the economy. 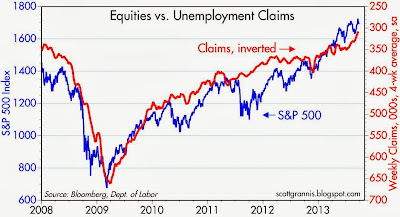 The chart above compares unemployment claims (inverted), to show that stocks have fairly closely tracked the decline in unemployment claims. 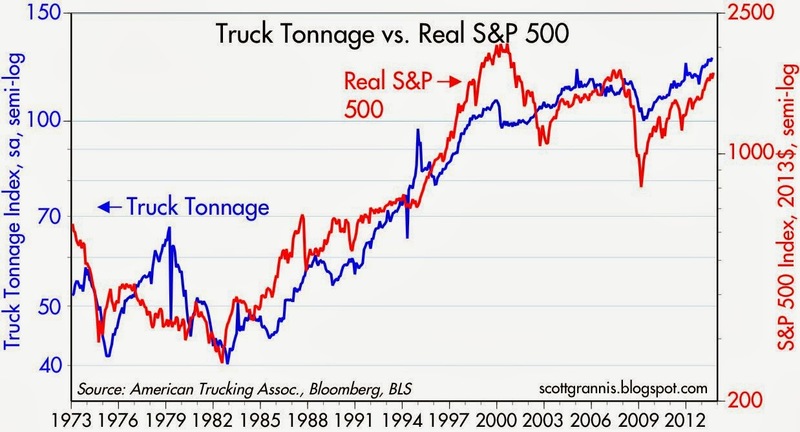 The chart above compares the inflation-adjusted level of the S&P 500 to an index of truck tonnage carried, itself a proxy for the physical size of the economy. 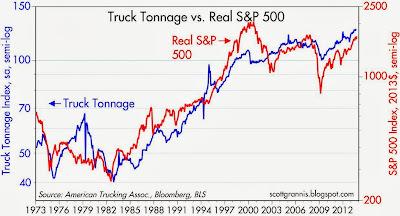 The chart suggests (correctly, when viewed after the fact) that stocks were very expensive in 2000, having "overshot" the improvement in truck tonnage, and that stocks were very cheap in early 2009, having contracted by more than the decline in truck tonnage. 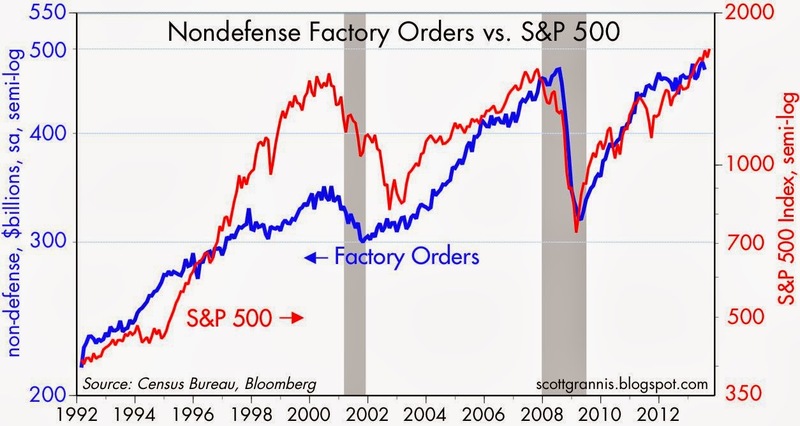 The chart above compares the level of factory orders to the S&P 500. 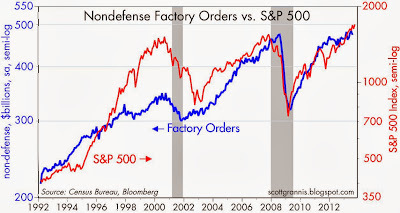 Post-recession, stocks have increased by almost exactly the same order of magnitude as factory orders. 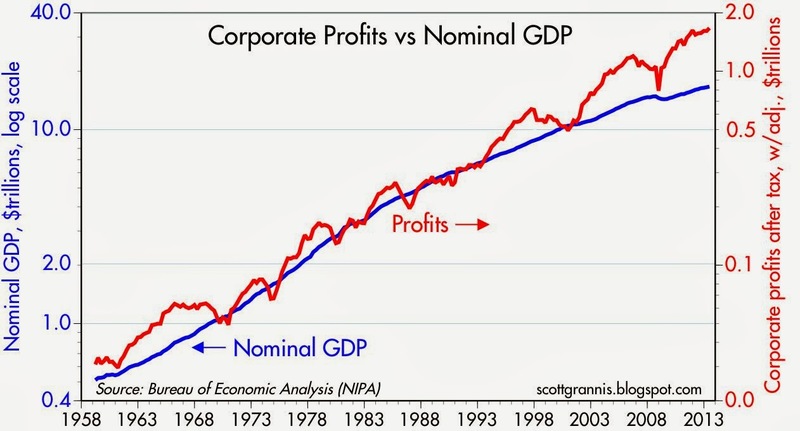 It should not be surprising that corporate profits tend to rise in line with the growth of the economy. 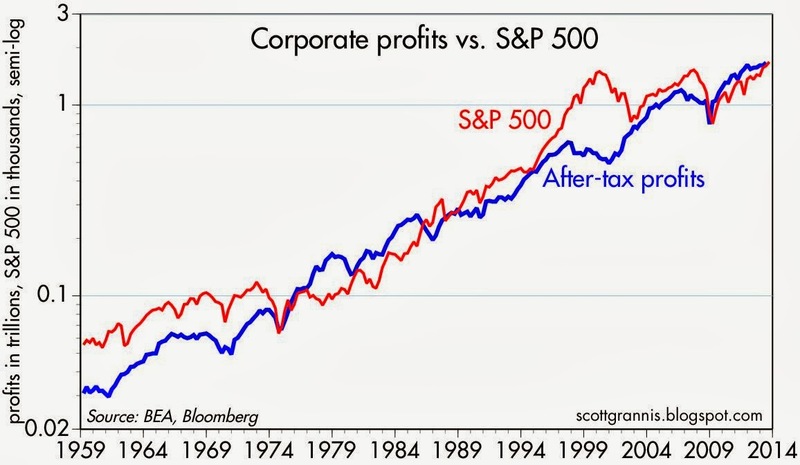 (What should be surprising, however, is that since 1975 the S&P 500 tends to be a constant multiple of after-tax corporate profits.) 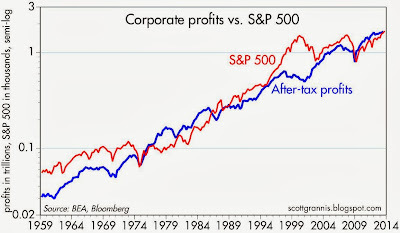 This chart shows that, since 1959, stock prices (excluding dividends) have increased by a factor of 30, while after-tax corporate profits have increased by a factor of 54, with most of the difference attributable to the period prior to 1975. 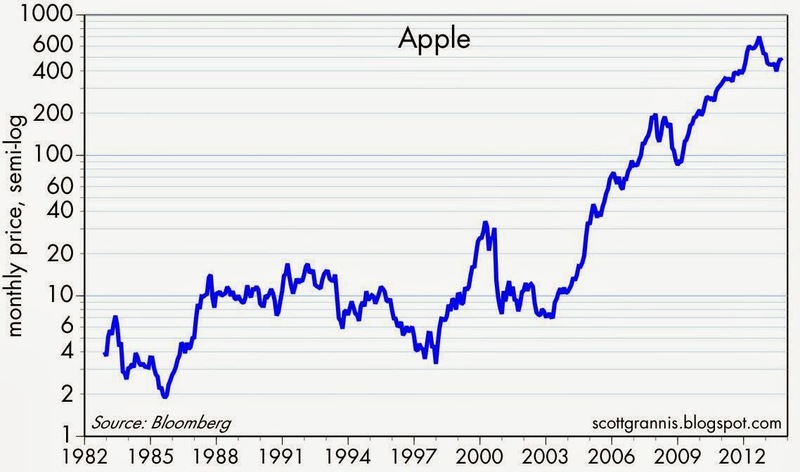 Once again, the overvaluation of stocks in 2000 is quite evident. The economy is doing better, and so are stocks. 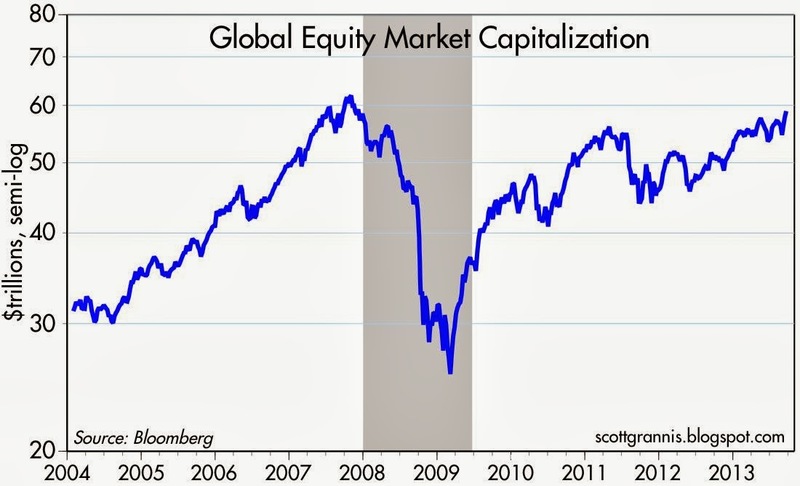 There is no sign here of any irrational exuberance on the part of stocks. Labor market conditions have improved significantly in the past month or so. Combine this with the dramatic improvement in households' finances this year, and one is forced to ask: why is there still so much pessimism in regards to the economy? To be sure, there are lots of things that could be better (e.g., the labor force participation rate, the unemployment rate), but there are important labor market metrics that are now almost as good as they get. 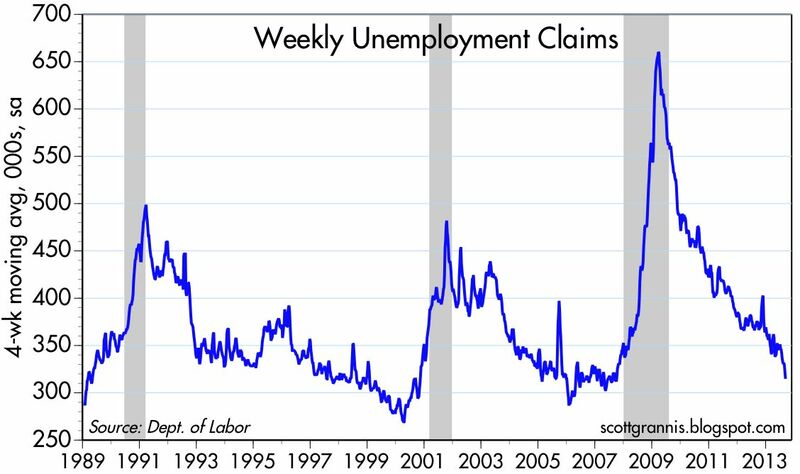 In the past six months, initial claims for unemployment have declined at a 27% annualized pace. They have rarely been this low. Labor market conditions have improved significantly; the chances of a worker being fired today are almost as low as they have ever been. 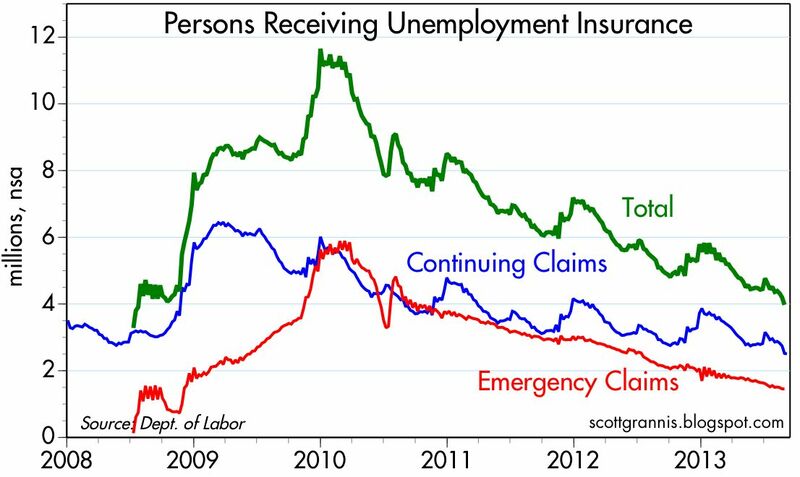 The number of people receiving unemployment insurance has declined 24% in the past year, and is now down almost to pre-recession levels. With labor market conditions about as tight as they get, and with corporate profits at record levels, the economy is primed for a burst of hiring and stronger growth IF business confidence improves. This is not such a bad problem to have, since there are any number of things that can be done to unleash the economy's pent-up potential: for example, we could cut tax burdens, reduce regulatory burdens, improve confidence in monetary policy (e.g., start tapering, start raising short-term interest rates), and simplify the tax code. The private sector is ready to go; now we just need to get government out of the way. If the thinking members of the Democratic Party (there's at least one) don't wake up soon and decide that Obamacare's individual mandate needs to be postponed for at least a year—in order to fix its many egregious elements or, better yet, start all over from scratch—then the country is on the verge of entering what could be its worst nightmare: a healthcare train wreck of epic proportions. Monumental hubris: For starters, it is inconceivable that any government body could, by fiat, reorganize and re-regulate one-sixth of the U.S. economy and have the results be anything like what was promised or intended. (If government could work miracles, the Soviet Union would be eating our lunch today.) Government bureaucrats and agencies cannot possibly design a healthcare system that will function more efficiently than what could be achieved if the private sector and market forces were allowed free rein. The only way that healthcare could possibly cost less, while covering more people, is for the government to impose rationing, something that was explicitly not promised. The unintended consequences of this law, some of which have already appeared, are virtually impossible to overestimate. Huge cost increases for many young people: The Manhattan Institute estimates that next year "Obamacare will increase underlying insurance rates for younger men by an average of 97 to 99%, and for younger women by an average of 55 to 62%." Huge marginal tax rate increases on the middle class and on married couples: In light of the higher premiums occasioned as a result of the government's insistence that qualifying health insurance policies provide much broader coverage that current high deductible policies, and as a result of the inability of insurers to charge more for those with pre-existing conditions, and in order to entice people to enroll, Obamacare provides generous tax credits (subsidies) to those earning less that a certain amount. The subsidies phase out, however, as income increases. But once income exceeds the threshold (e.g., $46K for singles and $62K for couples), the complete phaseout of the subsidy can equate to a marginal tax far exceeding 100%, causing many to lose over $10,000 in subsidies when they earn just one additional dollar. This can only be mitigated by married couples getting divorced, or by individuals refusing raises (or not seeking promotions) that push wages above the threshold level, or by not purchasing insurance and paying the non-compliance tax. It also penalizes workers for working overtime, as a result of so-called "subsidy gaps." This could have far-reaching and painful consequences for many millions of middle class workers and families, and it creates egregious disincentives to work harder or more hours. Additional taxes that fall mainly on the middle class: There are a variety of new taxes that are already in effect starting with the 2013 tax year. A new 2.3% excise tax on gross sales of medical devices, which "will make everything from pacemakers to artificial hips more expensive." A new cap on deductions for high medical expenses equal to 10% of adjusted gross income, which replaces the previous cap of 7.5%. A new tax on Flex Spending Accounts, equal to $2,500 (formerly unlimited), will affect 30-35 million people who currently use FSAs to pay for basic medical needs. This will severely impact parents of "special needs" children. A new Super Saver Surtax of 3.8% on investment income earned in households making at least $250K. A higher Medicare Payroll Tax of 2.35% (formerly 1.45%) on wages of married couples earning over $250K, and 3.8% (formerly 2.9%) on income of the self-employed earning over $250K. And starting next year, a non-compliance tax for anyone not buying qualifying health insurance, estimated to impact at least six million families, most of whom are middle class. Meanwhile, the list of companies that have downsized their workforces, and/or pushed people into part-time jobs, and/or no longer offer healthcare insurance to their workforce is long and growing, and making headlines almost every day. A growing number of large and important unions are getting quite upset and concerned. The early fallout from Obamacare—the loss of jobs, the increase in part-time employment, the regulatory burdens, the increased costs, and the higher taxes—has undoubtedly acted to worsen the overall health and vitality of the economy, and it is only likely to get worse with time. If Obamacare proceeds, the problems and dissatisfactions will mount, and Democrats will face serious consequences come next November. Next year's election would effectively become a referendum on Obamacare, and my money says that the voters will roundly reject it and its hapless creators. UPDATE (Oct. 4th): See this Facebook page for real life Obamacare nightmare stories. The Republicans didn't need to defund this program, it will destroy itself. 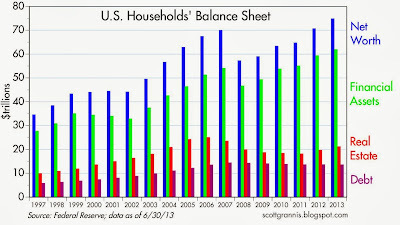 The Federal Reserve today released its estimate of households' balance sheet as of the end of June. The report contained some significant upward revisions to past estimates of financial assets and net worth, with the result that household net worth now stands at $74.8 trillion, up some $4.5 trillion from the previous (March '13) estimate, and up $18.4 trillion from the recession low. Virtually every metric of households' financial health has shown significant improvement over the past several years. Owner's equity in household real estate has surged 50% since 2009; net worth and financial assets are up 35% from their March 2009 low; the value of households' real estate holdings is up 17% in just the past two years; owner's equity as a percent of household real estate has jumped to almost 50%, up from its all-time low of 37% four years ago; household debt has declined by almost $1 trillion from its 2008 high, and is now back to the levels of early 2007. Net worth at a new high, financial assets at a new high, real estate values recovering, debt declining: what's not to like? 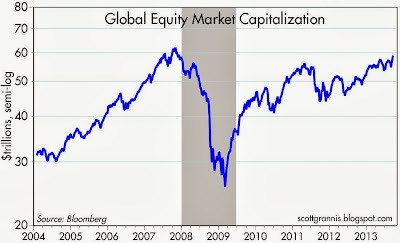 And the improvement is not limited to the U.S. As the chart above shows, global equity market capitalization has now reached a new post-recession high, up by 130%, or more than $33 trillion, from the March 2009 lows. 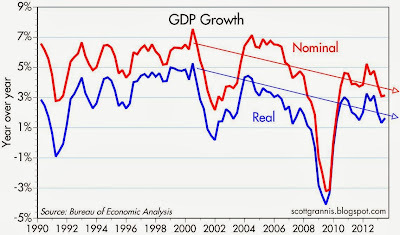 To be sure, the economy has still not fully recovered from the effects of the Great Recession. But the pace and magnitude of the improvement in the past several years is far better than anyone would have dared hoped for just four years ago. This should be the stuff of major headlines, something to shout from the rooftops. Why, then, is monetary policy still in panic mode, with short-term interest rates hovering near the zero bound for more than four years? 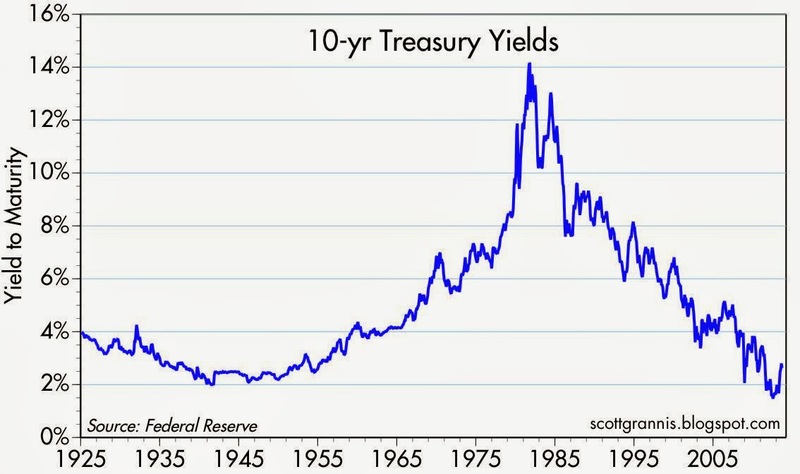 Why are 10-yr Treasury yields still under 3%, at levels last seen during the Great Depression? 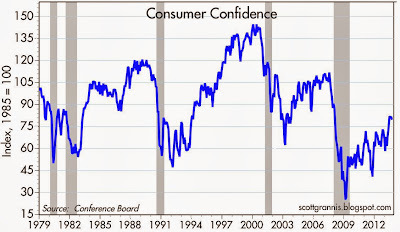 Why is consumer confidence still down at levels associated with every recession in the past 35 years? Just because things could (and should) be a lot better? Pessimism has its place, and there is no shortage of things that could be improved. To name just a few: the federal deficit is still relatively large; the unemployment rate is still relatively high; the labor force participation rate is miserably low; owner's equity should be at least 60% of real estate holdings; regulatory burdens are a huge, deadweight burden on almost everyone; entitlement spending is on an unsustainable path; and Obamacare promises to self-destruct. Yes, there are many things wrong out there, but at the same time there has been a whole lot of improvement. Those who have viewed the glass as half empty, and who have thus avoided taking on risk, have passed up tens of trillions of dollars of gains. Those optimists who have viewed the glass as half full have been richly rewarded. If things continue to improve, and if we can simply avoid a recession, there are more gains to be had by taking on risk and avoiding cash. 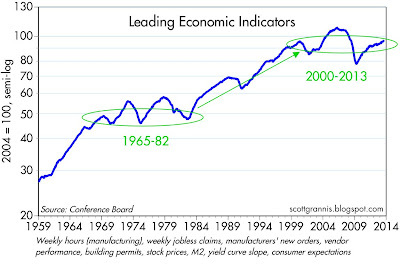 The market has consistently underestimated the ability of the U.S. economy to grow and improve. Even though we remain stuck in the weakest recovery ever, the economy has still managed to exceed the market's apparently dismal expectations. 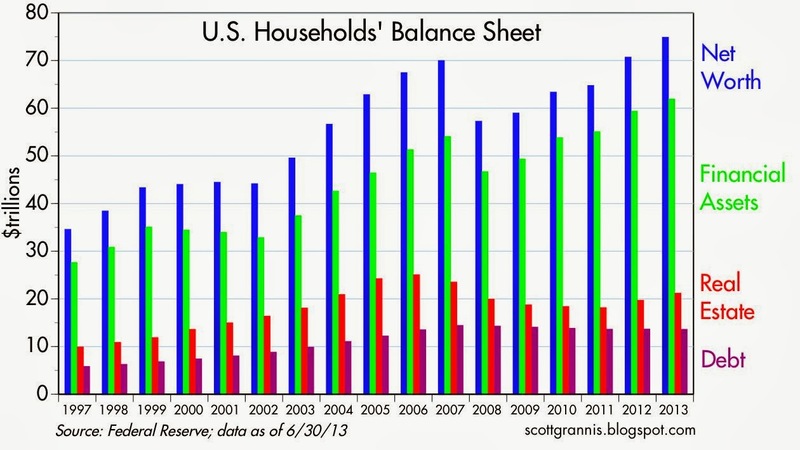 The improvement in households' balance sheets lends a lot of strength to my argument. 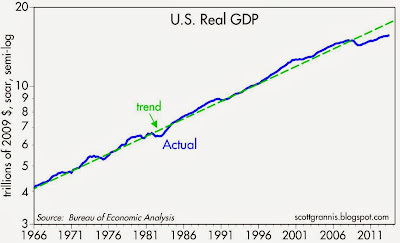 There is real, significant, and fundamental improvement that has taken place in the U.S. economy, and the market has either ignored it or chosen to believe that it is ephemeral. It's not. According to Blogger, this blog gets 2,000-3,000 pageviews per weekday. That's a drop in the bucket compared to the big boys, but it's probably enough to get reasonable results in regards to the popularity of different computer operating systems that people are using these days to browse the internet. 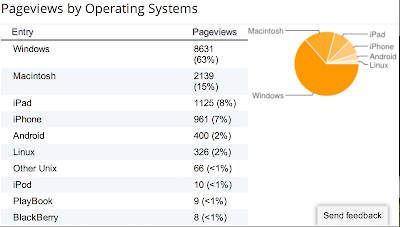 Apple has gone from relative obscurity 10-15 years ago to now accounting for almost one-third of the traffic to my site; Apple's growth has come mainly from former Windows users. The world has lots more Android smartphones than Apple smartphones, but lots more Apple tablets than Android tablets. Yet Apple devices account for 15 times more traffic than Android devices! Either I am effectively catering to iPhone users and/or disparaging Android users, or this says something profound about the type of people who gravitate to the Apple mobile platform vs. the Android platform. All smartphone and tablet users are not created equal. Comments welcome. 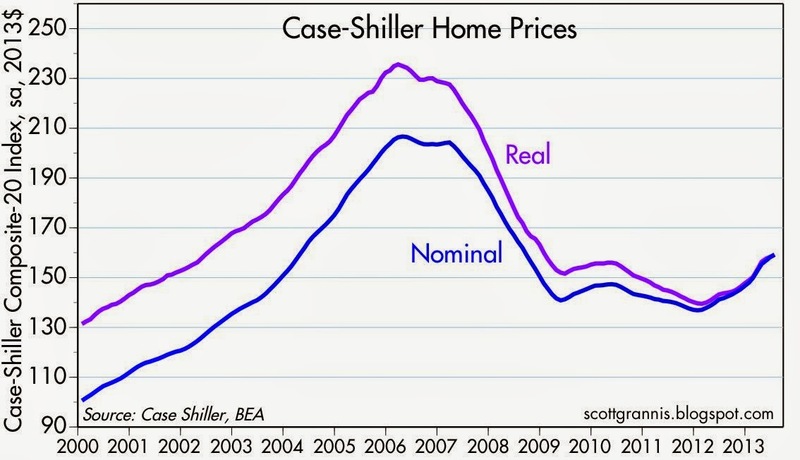 More evidence of the housing recovery: according to Case-Shiller, home prices rose over 12% in the year ending July, reaching a post-recession high in both real and nominal terms. 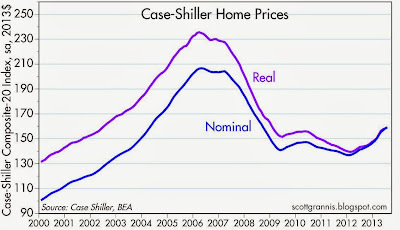 However, prices are still 23% below their early 2006 peak in nominal terms, and 32% below their peak in real terms. Despite their recent rise, 30-yr fixed mortgage rates are still 25% below their 2006 average, which means that housing is still far more affordable today than it was seven years ago. The chart above is based on the seasonally adjusted version of the Case-Shiller Home Price Index. In inflation-adjusted terms, prices in July were the same as they were in June 2002. 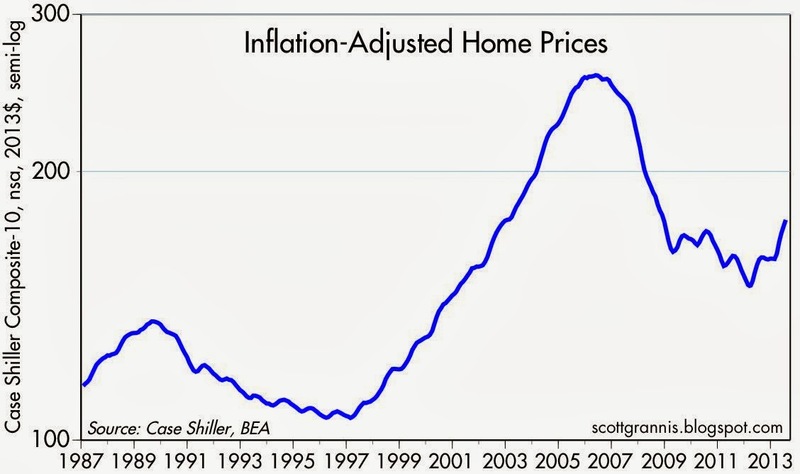 The real estate bubble inflated and deflated, and appears to be reflating once again. 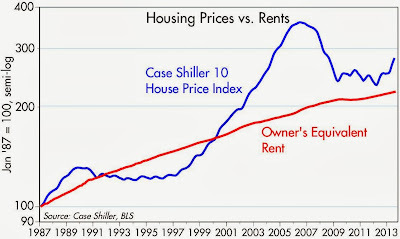 The above chart uses the Case-Shiller index covering only 10 major housing markets, but extending back to 1987. The housing market appears to be embarking on yet another uptrend cycle, having survived two declines in the past quarter century. In real terms, homes today are selling for about 50% more than in 1987. However, back then 30-yr fixed rate mortgages carried an interest rate of about 9%, twice as high as today's rate. This chart compares the BLS's estimate of the rental value of U.S. homes to the Case Shiller 10 index. 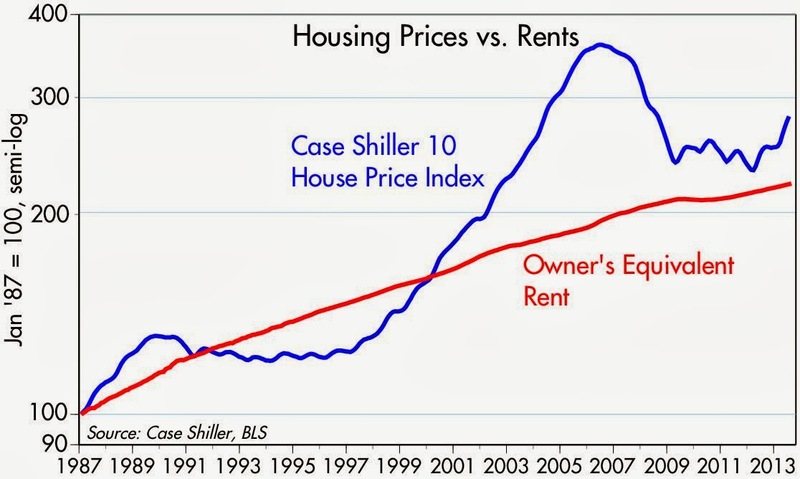 BLS has been criticized for as long as I can remember for either understating or overstating housing prices and their contribution to inflation. Based on this chart it would appear that BLS is doing a fairly good job of tracking housing prices over time, while smoothing out the big ups and downs. In recent months mortgage rates have jumped by about 1 full point, and home prices have risen. 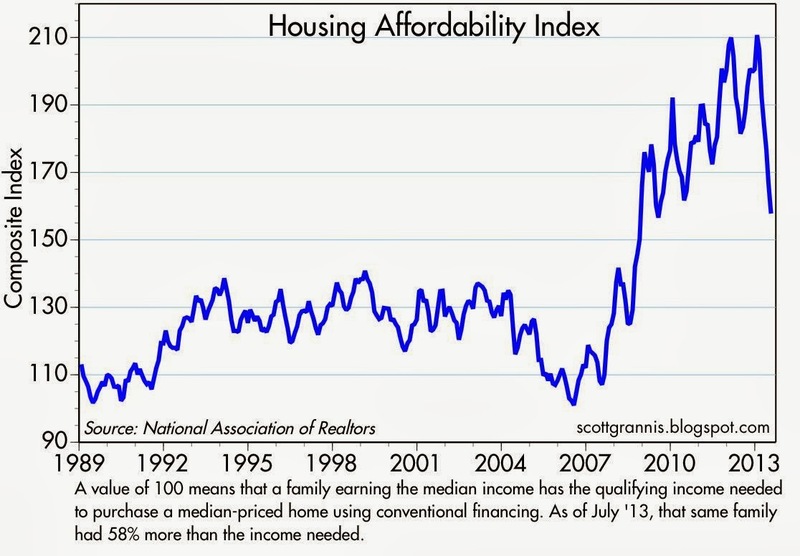 This has resulted in a significant decline in housing affordability. But as the chart above suggests, homes still remain affordable from a long-term historical perspective. Nevertheless, the big decline in affordability in recent months is likely to keep prices from surging in the months ahead; market forces—higher prices and higher mortgage rates—are starting to discipline a housing market that had probably gotten a bit frothy. The timing of when the Fed begins to "taper" its purchases of Treasuries and MBS—currently running at $85 billion a month—has been the source of much market angst in recent weeks. Many expected the tapering to begin this month, but now the guessing is that it may start next month or in December. In any event, it's really much ado about nothing, and let me explain why. Briefly, QE hasn't done much to change the money supply; it hasn't done much to stimulate the economy; it hasn't been inflationary; and banks already have an almost unlimited ability to expand lending. Since massive amounts of QE haven't done much (if anything) to help the economy or to create unwanted inflation, then tapering QE by a small amount isn't likely to hurt the economy or create deflation. And since banks already have enough reserves to support virtually unlimited lending, reducing the growth of bank reserves by a small amount is not going to materially slow or discourage bank lending going forward. It's almost a non-event. As the charts above show, the Fed's Quantitative Easing purchases of bonds have not resulted in any undue expansion of the money supply. 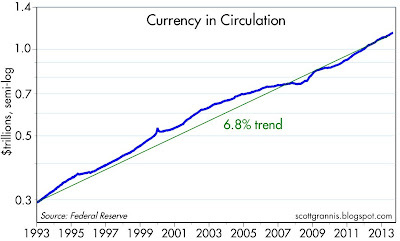 Put another way, the Fed has NOT been "printing money" as so many seem to think. The M2 measure of the money supply, arguably the best measure we have, has been growing only slightly faster than its long-term average rate of about 6% per year for the past five years during which we've had plenty of QE. The second of the above charts shows this same process on a shorter time frame. On the surface, there is nothing unusual going on with the money supply, despite the Fed's purchases of $2.7 trillion of Treasuries and MBS since September 2008. 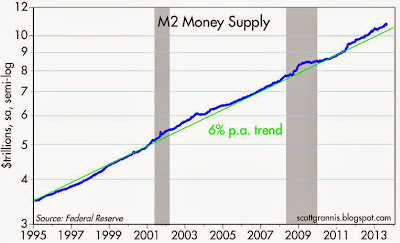 If there is anything unusual going on with the money supply, it is bank savings deposits (above chart). 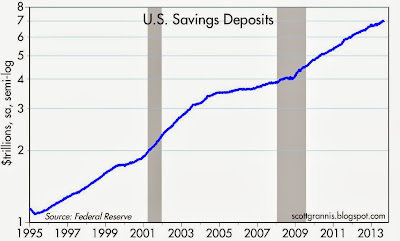 Coming out of the last recession, bank savings deposits started growing at a very fast 10-15% per year clip. In the past year, growth has slowed a bit to a 9-10% annual pace. Bank savings deposits are now up over $3 trillion dollars in the past four years. This rapid growth of savings deposits owes much to the public's demand for safe-haven assets. 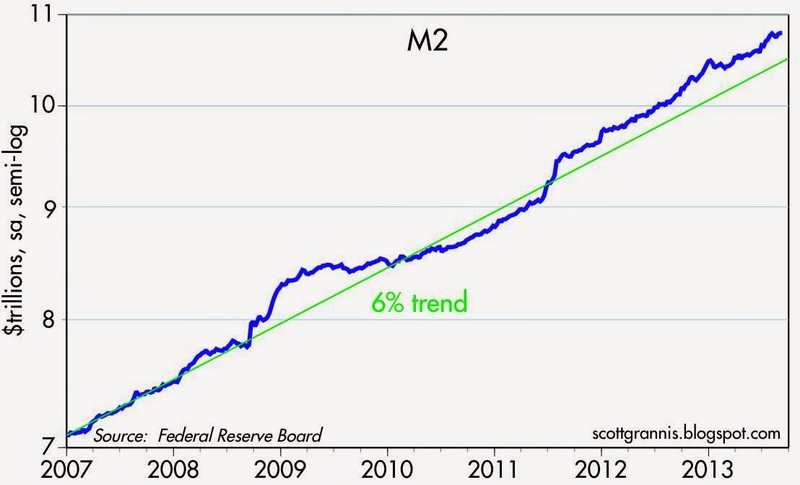 This is simply more evidence that the world's demand for "money" has been very strong, and the Fed has simply accommodated this demand. That is entirely appropriate and not inflationary. When it finally happens, the first phase of the tapering of bond purchases will mean that instead of buying $85 billion of Treasuries and MBS per month, the Fed will be buying $65 billion per month. As the chart above shows, that is a fairly small change on the margin. Bank reserves now total some $2.3 trillion, so the Fed's monthly additions of $85 billion represent an expansion of the existing stock of reserves of less than 4%. Despite the trillions of QE, despite four years during which money market rates have been close to zero, and despite the fact that the federal government has borrowed and spent an additional $4.7 trillion since mid-2009, the economy has experienced its weakest recovery ever. What's going on? If the most massive package of monetary and fiscal stimulus in the history of our country has produced the weakest recovery on record, a layman could be forgiven for thinking that without all this buying, borrowing and spending by our government, we would be in a depression. But there's another and better way to see this: When the government borrows, it takes money from someone. When it spends, it gives that money to someone else. It takes from Peter and gives to Paul. That is only "stimulative" if Paul ends up doing something more productive with the money than Peter would have if he had kept it. It's much more likely that all the borrowing and spending has worked to depress the economy, not stimulate it. That's because the bulk of the deficit-financed spending has gone to fund transfer payments. We've borrowed money from the productive members of society and given it to the non-productive sectors. The money has been spent unwisely, inefficiently, and even wasted. That's a perfect prescription for slow growth. (And of course there's all the money that has been handed out in the failed pursuit of "green" technologies, the huge subsidies to agriculture, and the multitude of deductions in our tax code which basically amount to corporate welfare.) In short, the "spending multiplier, as we now know, is definitely less than 1. 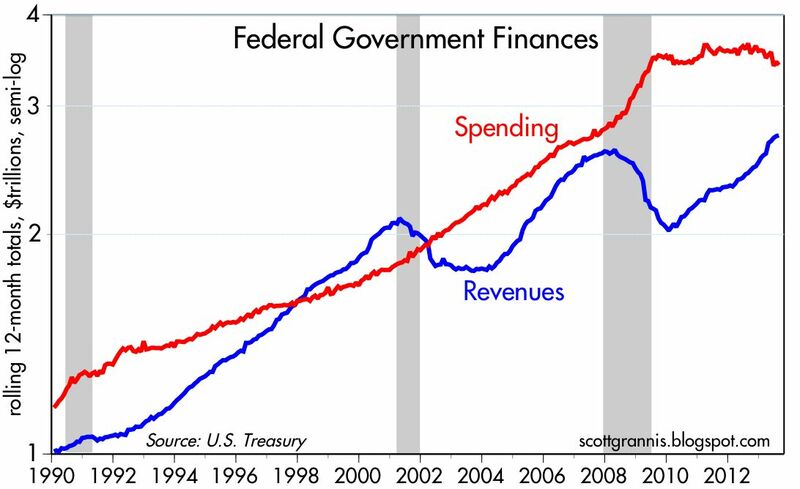 Here's the real bottom line that I wish taxpayers would understand: if the government hadn't borrowed and spent so much money, we would probably be enjoying a stronger, more normal recovery. 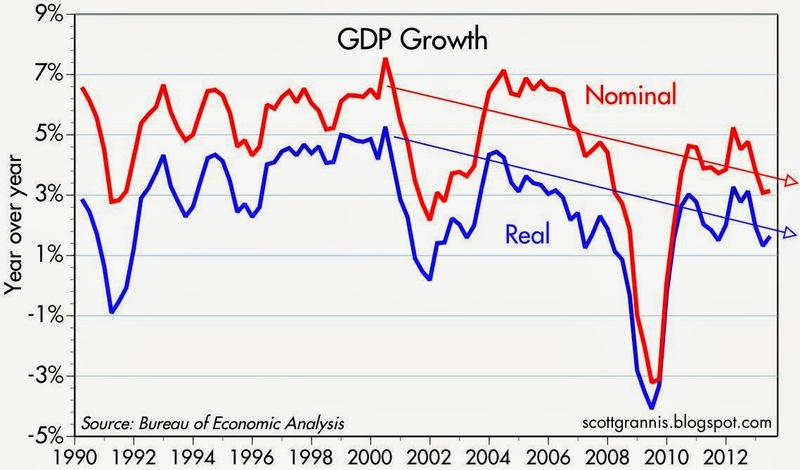 Not only has real GDP growth been miserably slow, so has nominal GDP growth. It's a weakening trend that has been in place for many years. 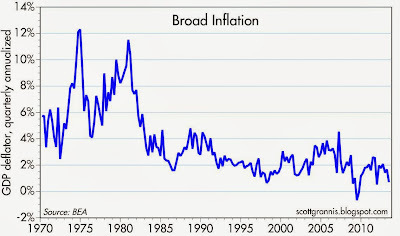 And as the chart above shows, inflation has been very low for many years. 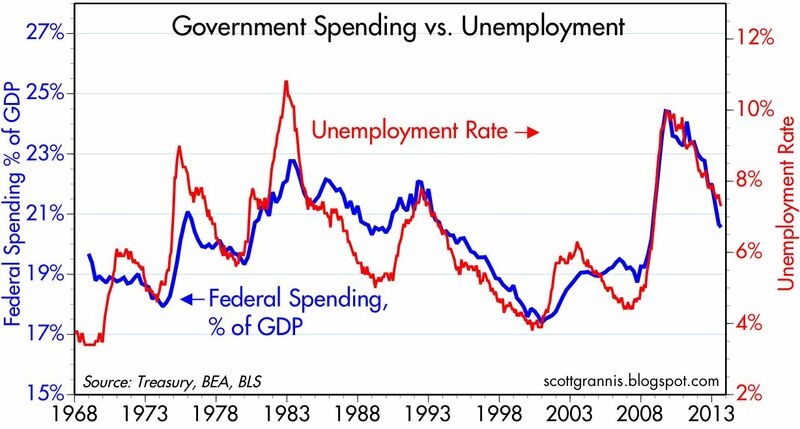 In short, there is no evidence here to support the notion that the Fed's "stimulus" has stimulated anything. 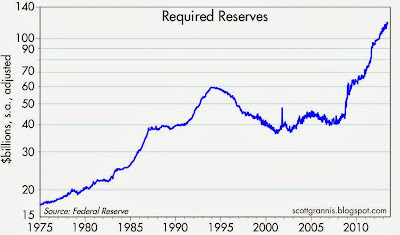 Bank reserves are important because in our fractional reserve system banks need to have reserves to collateralize their deposit base (about $1 of reserves for every $10 of deposits). Prior to 2008, reserves paid no interest, so holding reserves (which banks have to buy with real money) represented a deadweight loss. 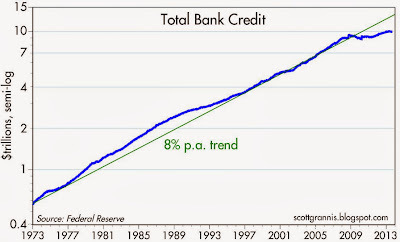 By limiting the amount of reserves available to the banking system (one of the main functions of the FOMC), the Fed could effectively control the degree to which banks could expand their lending. Since late 2008, however, that changed completely. The Fed now pays Interest on Reserves, currently 0.25%. 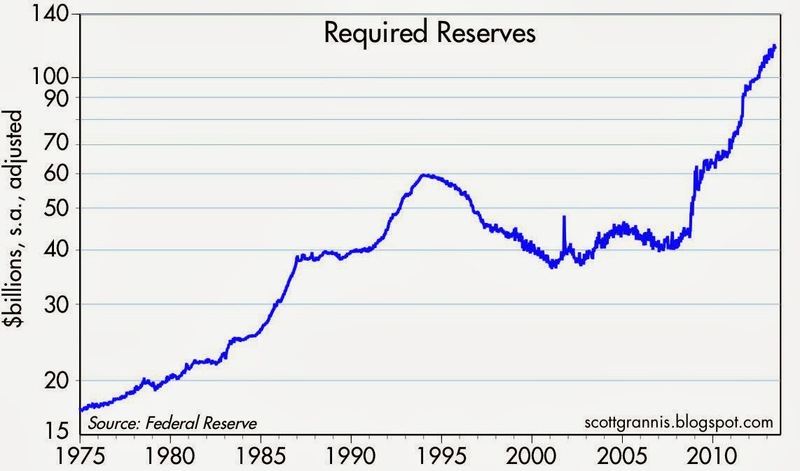 That means that reserves are no longer a deadweight loss, they are much more like T-bills. They are a short-term, liquid, default-free, interest-paying asset. Banks now have an incentive to hold reserves, whereas before they had a disincentive to hold reserves. 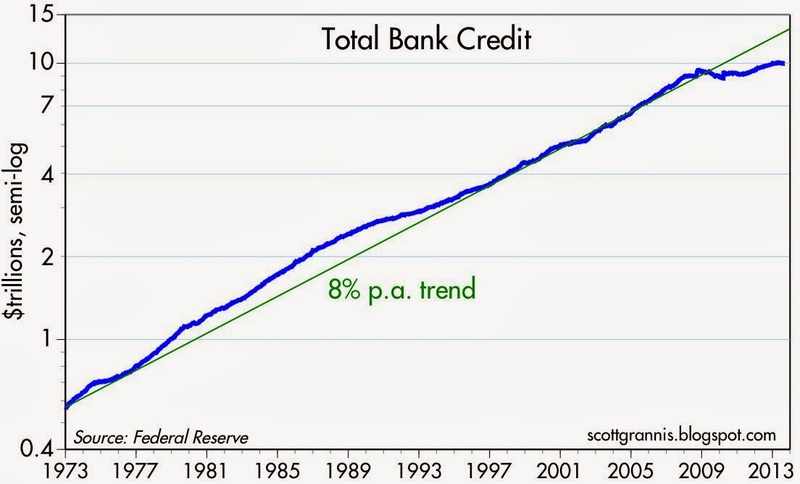 Bank reserves are now an asset, just like loans are. Banks now weigh the relative advantages of holding reserves versus making loans. Given the risks of lending money in a weak economic environment, does the prevailing level of interest rates offer a significantly higher risk-adjusted return than holding reserves? If so, banks have the ability today to lend with virtually no limit, by using their existing reserves to collateralize new loans. That they haven't done so means that they find holding reserves (which is equivalent to lending money to the Fed) more attractive than making loans to the public. 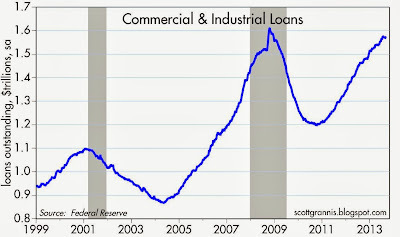 As the first chart above shows, banks have been increasing their lending, but at a relatively slow pace in recent years. 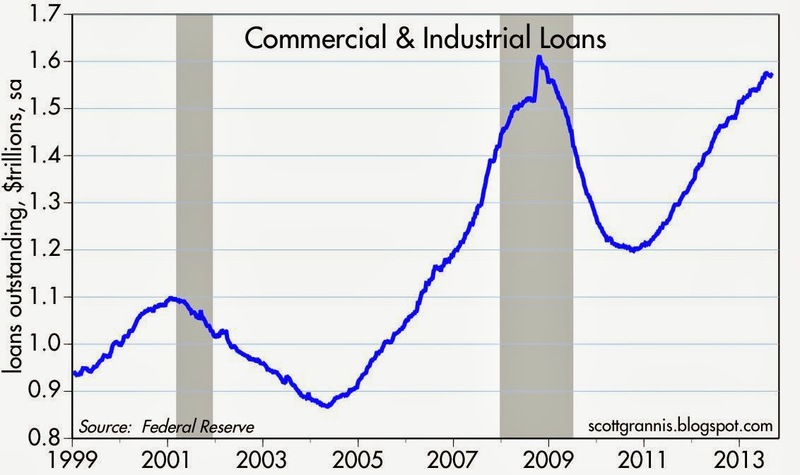 As the second chart shows, C&I Loans (bank lending to small and medium-sized businesses) have been growing much faster, but still they have not exceeded pre-recession levels. The facts say that banks have simply preferred to accumulate lots of reserves rather than make lots of new loans. The above chart shows exactly how much banks have stockpiled in the form of reserves that are in excess of what they need to collateralize their deposits. 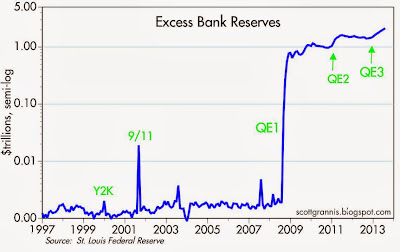 It also makes it clear that QE2 and QE3 made relatively modest incremental changes to excess reserve balances. Tapering, when it begins, will hardly be noticeable on this chart. 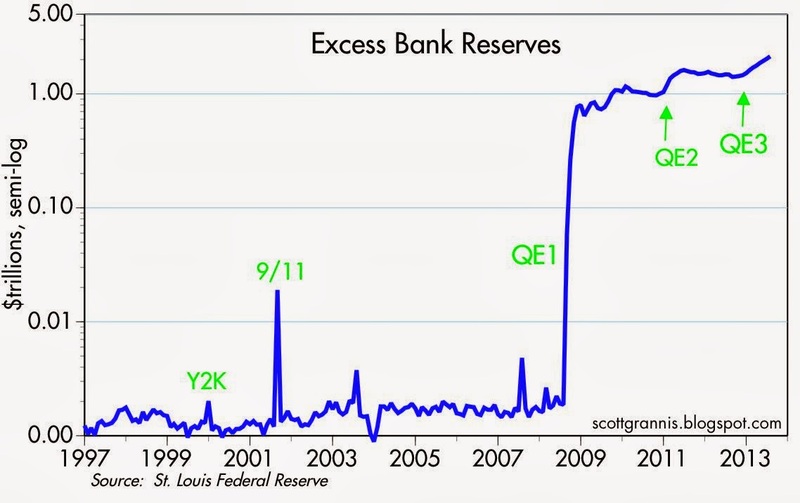 Tapering QE is only threatening to the extent it starves the banking system for high quality, short-term assets. 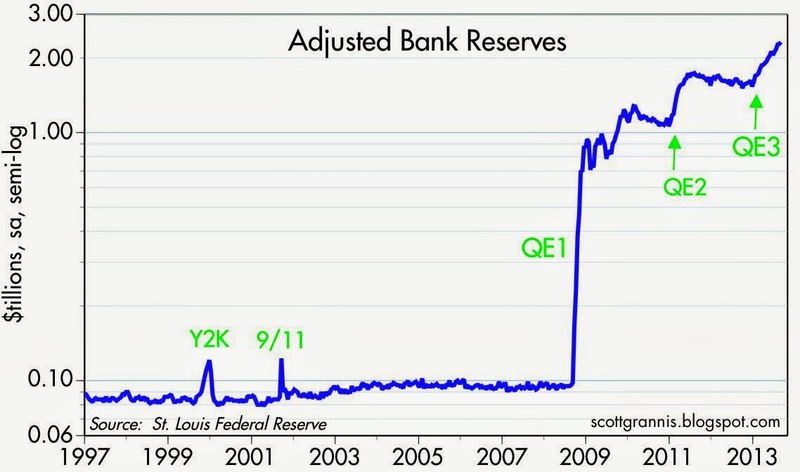 As I've argued since October 2008, and more recently here, the main objective of QE was not to stimulate the economy, but to satisfy the world's huge demand for safe money in the wake of the disasters that unfolded in 2008. 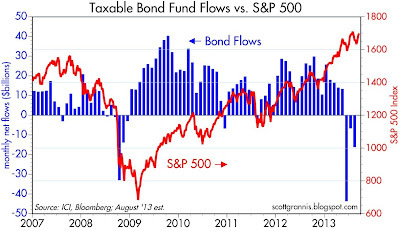 And that, in the end, is the big question: is the demand for more safe assets still strong? If it is, then tapering runs the risk of starving the banking system for liquidity. If not, if demand for reserves is beginning to decline because banks are becoming more confident in the health of the economy, then tapering is the right thing to do and it shouldn't be a problem at all, as I explain above. In my post last week, I argued that the demand for safe assets is beginning to decline, but it is still in its early stages. Tapering is the first step on the road to an eventual tightening of monetary policy, which I define as a Fed-induced increase in real short-term interest rates. Once the Fed tapers its bond purchases (and no longer purchases any Treasuries or MBS), then the next step will be to begin to raise the amount of interest it pays on reserves (currently 0.25%). But it's a very long road we're looking at. The Fed won't be tightening monetary policy for a long time, not until the economy becomes noticeably stronger. It may take 6 months or so to end QE3, and then it might be another 6 months or so before short-term interest rates start to go up. It might take years before real interest rates become high enough to present a problem to the economy. Be sure to read Calculated Risk's excerpts of Vice Chair Dudley's recent remarks. If it were up to him, there would need to be substantial improvement in the labor market before he would even consider tapering, and that could take 6-9 months if not more. The chart above compares the real Fed funds rate (the difference between the Fed funds target rate and the year over year change in the PCE deflator) with recessions. 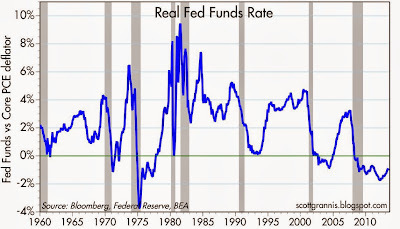 Note that every recession since 1960 has been preceded by a marked tightening of monetary policy, in which the real Fed funds rate reaches or exceeds 3%. 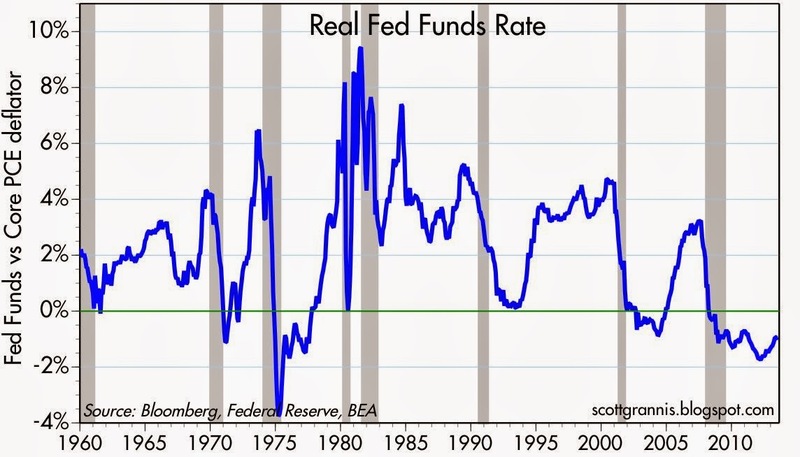 Currently, the real funds rate is -1%. Again, it will be a long time before monetary policy becomes tight enough to worry about. Rather than fret about tapering, it makes more sense to worry about who the next Fed Chairman is going to be. Tapering is like easing up on the gas pedal, so that the car accelerates at a slower pace. The more important phase of monetary policy will be tightening, which is akin to stepping on the brakes. Janet Yellen—the current favorite to succeed Bernanke—has the reputation of being a "dove," which means that she would likely be less aggressive when it comes to tightening than others, since she firmly believes that monetary policy has the ability to "stimulate" the economy. 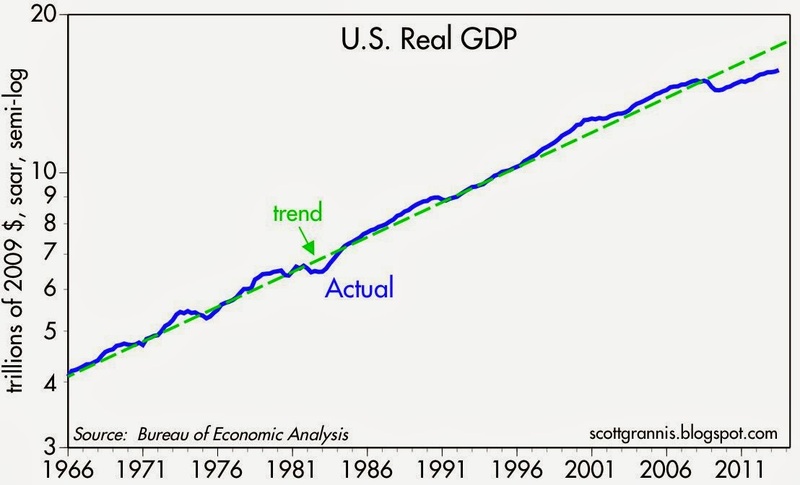 This is a theory that is not shared by most monetarists and supply-siders, who believe that money growth that exceeds the demand for money only causes more inflation, not more real growth. John Hilsenrath, writing in today's WSJ, says "Yellen Would Bring Tougher Tone to Fed," while also noting that she "has pushed the Fed to use low-interest-rate policies to spur faster economic growth and bring down unemployment." Yellen may thus be the first Fed Chair to practice "tough dove love," a new style of monetary policy that will undoubtedly raise the market's level of uncertainty. 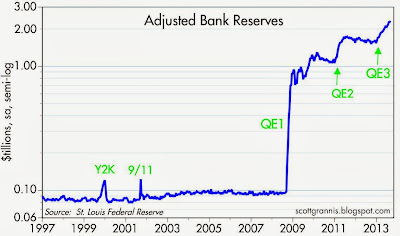 In order to reverse QE, the Fed will need to a) shrink the supply of bank reserves by selling bonds and/or not reinvesting interest or principal payments, and b) raise the interest rate paid on reserves. These actions must offset banks' declining demand for reserves and make the interest rate they receive on reserves attractive, on a risk-adjusted basis, relative to what they think they can earn by increasing their lending activities. To do less would be equivalent to creating a surplus of money (via excessive bank lending) that would likely fuel higher inflation. The next Fed Chair will almost surely oversee the Great Unwinding of Quantitative Easing. If not done correctly, we could find ourselves in a world of hurt. Yelled appears to lack the proper understanding of the limitations of monetary policy, and so the risk of a Yellen Fed is that monetary policy could become inflationary. But in any event, this is a risk that is still out there on the far horizon. Would a Yellen appointment be a reason to buy gold? Not necessarily. 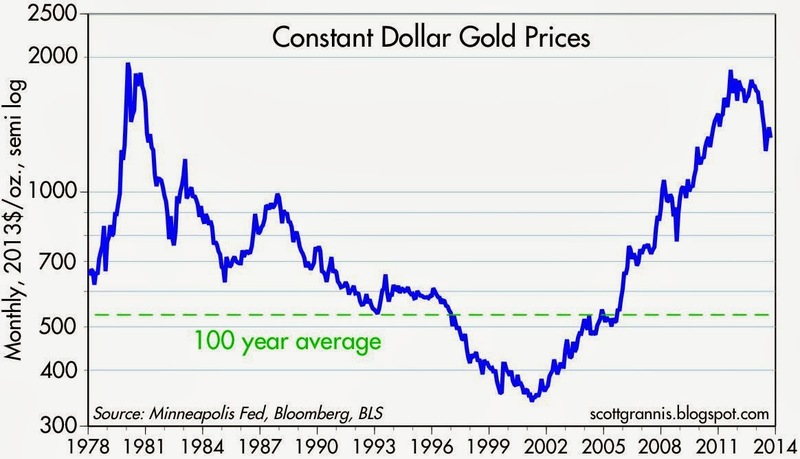 I would argue that even with gold's recent decline from $1900 to $1300, it is still priced to a lot of inflation that has yet to happen. 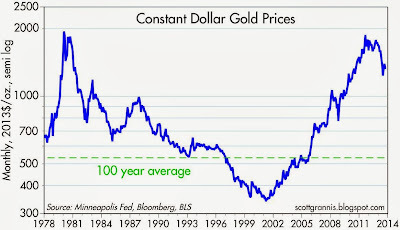 In real terms, golds is still trading significantly higher than its long-term average (see chart above). Would a Yellen appointment be a reason to sell the dollar? Again, not necessarily. 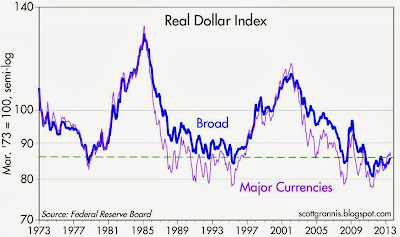 Although the dollar is up 7-10% from its all-time lows two years ago, it is still very weak from an historical perspective, which means that a lot of bad news is still priced in. Would a Yellen appointment be a reason to sell Treasuries and MBS? Probably. 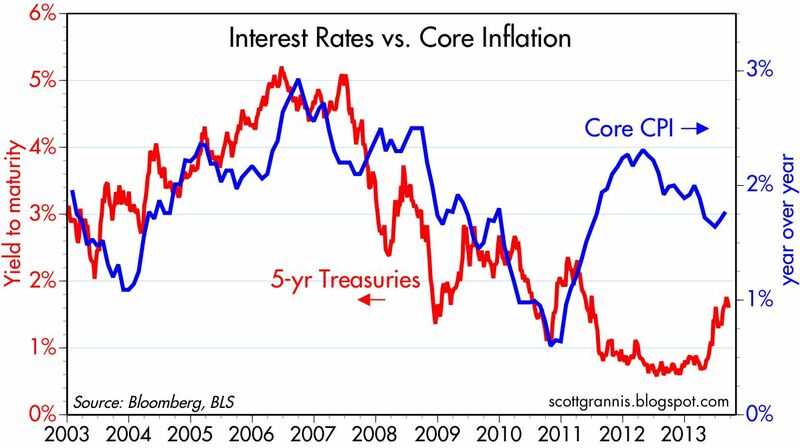 As I pointed out last week, interest rates are still relatively low compared to current inflation. How about stocks? I'll leave that for a subsequent post. On Wednesday I joined millions of people in downloading Apple's new and greatly improved operating system for mobile devices, iOS 7. After playing with it for awhile, I can say I'm delighted. It's like having a brand new phone. And it's not just me; in just two days, a significant portion of Apple's installed base has upgraded to iOS 7. A much greater percentage of Apple phones are now running the newest software than is the case with Android-based phones. It is reasonable to expect that, as Apple claims, iOS 7 will be the most popular mobile software in the world before too long, because the vast majority of iPhones and iPads being used today are eligible for the upgrade, and it is relatively easy to do. The same is not true of Android phones, only a fraction of which can use the latest version of Android. The new software represents a complete overhaul, adding hundreds of new features and capabilities, all with a fresh new look. One new feature, Activation Lock, means a stolen iPhone becomes useless; the phone cannot be reactivated without a user's Apple ID and password, and Apple requires all passwords to be relatively complex. The camera software is now easier to use, with added editing features. Font sizes can be increased or decreased. Developers now have 1,500 new APIs to play with, opening the door to even more innovation. Meanwhile, Apple's new iPhone 5S comes with a 64-bit processor (a first for the smartphone market), and a fingerprint scanner, both of which will be hard for competitors to copy in a short time frame. Plus, a new camera sports a bigger aperture, larger pixels, a new dual flash, and software capabilities not found in any camera. Reviewers almost universally consider the 5S to be the best smartphone on the market. Initial reports suggest the iPhone 5S is selling like hotcakes. 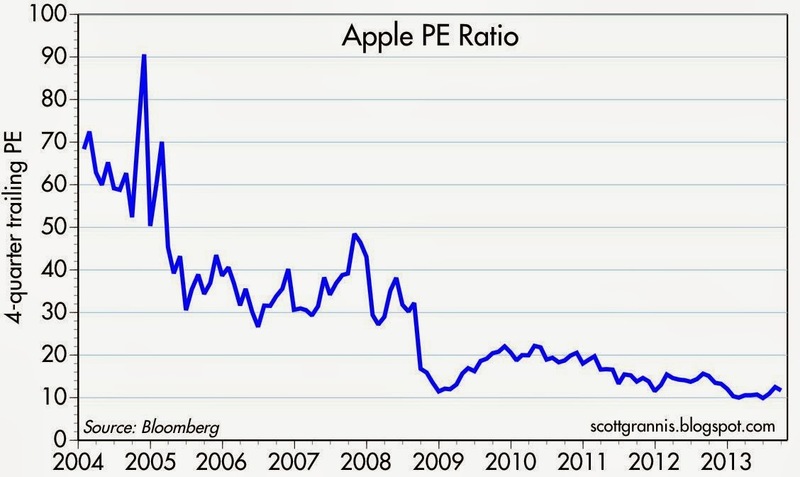 The cheaper 5C is likely to do very well in overseas markets. Within the next month or so, Apple is likely to introduce a new generation of iPads, and Apple already dominates the tablet market. Tablets are replacing laptops and desktops all over the world. Apple has over $100 billion in cash, equivalent to more than $110 per share, and it pays a 2.6% annual dividend—which represents only 10% of its current cash holdings. 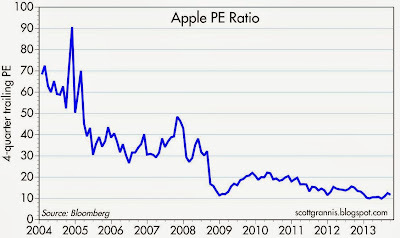 Backing out the cash, AAPL trades with a trailing PE of 9 and a forward PE of 9.2, which means that the market is pretty confident that Apple's best days are behind it, and there is little chance that earnings will continue to grow. That's a pretty pessimistic assessment of a company that has revolutionized and created entire industries (e.g., smartphones and tablets), and that continues to deliver high quality and innovative products to a global market with significant growth potential. You don't have to be a wild-eyed optimist to like this stock. 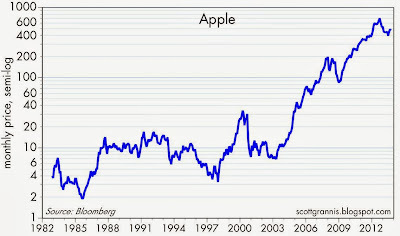 Full disclosure: I am long AAPL at the time of this writing. Just received my new iPhone 5S from Fedex. Took only a few minutes to set up, then about 30-45 minutes to load in all my settings and apps from iCloud. It's everything it was advertised to be, and the fingerprint ID works like a charm, obviating the need to swipe. I chose the "silver" model, which is identical in outward appearance to the "white" iPhone 5, except for the silver ring around the home button. It then took a few minutes to erase everything from my old phone, which is now in pristine condition and ready to be sold or transferred to another party. I'm somewhat surprised that Apple sold 9 million new phones over the weekend. I knew it would be a hit, just not this big of a hit. I tried the slo-mo video and it's great. I now look forward to seeing how much better the phone is in low light and with the new flash. As with the iPhone 5, the fit and finish on this new phone is simply fantastic, a work of industrial art. I played around with the slo-mo video some more, and it's not just great, it's astoundingly great. High-def slo-mo video is now available to the masses, and it will be used and consumed. The quality is exceptional, and it's so easy to edit! Plus, photos taken in low light and with the flash are now orders of magnitude better than with the camera on the iPhone 5, and that was an order of magnitude better than the 4S. I'm astonished at how much better it is. The camera alone is more than enough reason to get the 5S. The news of 9 million phones sold over the weekend was eclipsed by the news that more than 200 million iOS devices have upgraded to iOS 7 in the past 4-5 days, making it the fastest software upgrade in history. Apple users are extremely interested in how their devices function, and the vast majority will soon have the benefit of exciting new software features. Because of its extensive fragmentation (there are thousands of different models of Android phones out there), this will never be the case for users of Android devices. 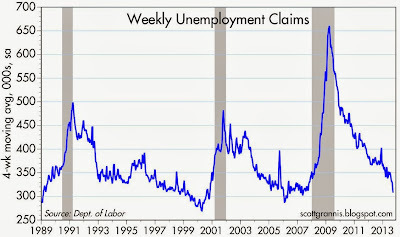 The number of first-time claims for unemployment has been artificially depressed in recent weeks due to computer system overhauls in two states, but the trend in claims has not likely changed: it's down, and the level of claims is about as low as it's ever been (first chart above). 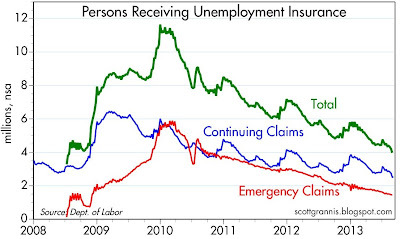 Meanwhile, the number of people receiving unemployment insurance has rarely been so small. The labor market may be plagued by a dearth of new positions, but it is certainly not plagued by too many layoffs. 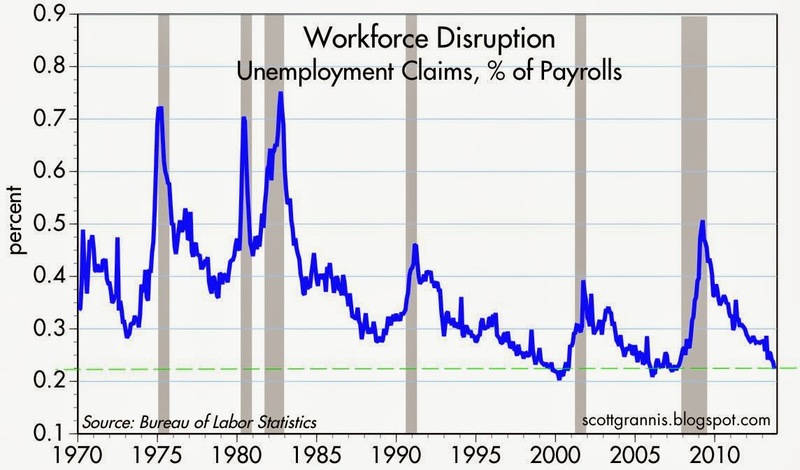 Indeed, today the chances of a worker being laid off are about as low as they have ever been (second chart above). 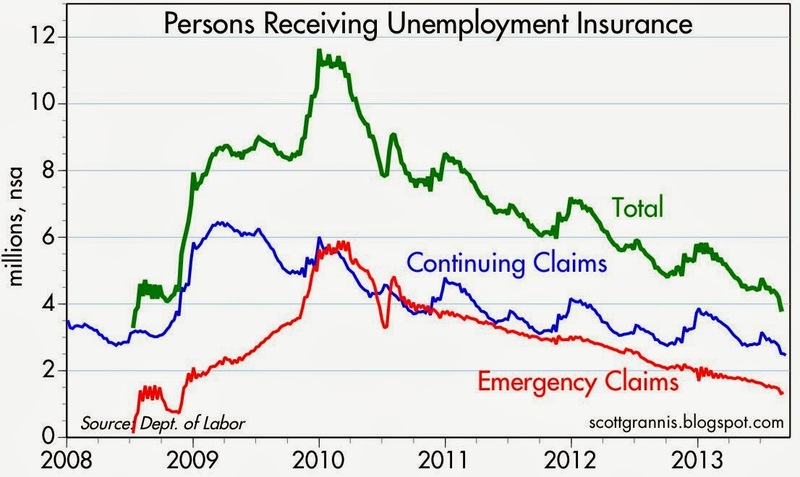 The number of people who continue to receive unemployment insurance has not been materially affected by computer problems, and that too continues to decline. In the past year, the number has shrunk by 22%, or 1.12 million, and it is getting very close to pre-recession levels. In this aspect of the workforce, the economy has managed to stage an almost-complete recovery. 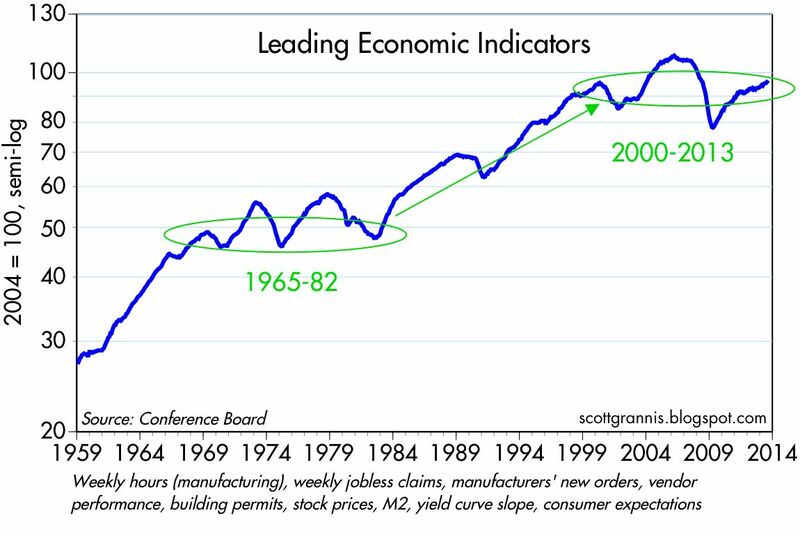 Very few observers pay much attention to the so-called Leading Economic Indicators, but the truth is that they haven't done such a bad job. 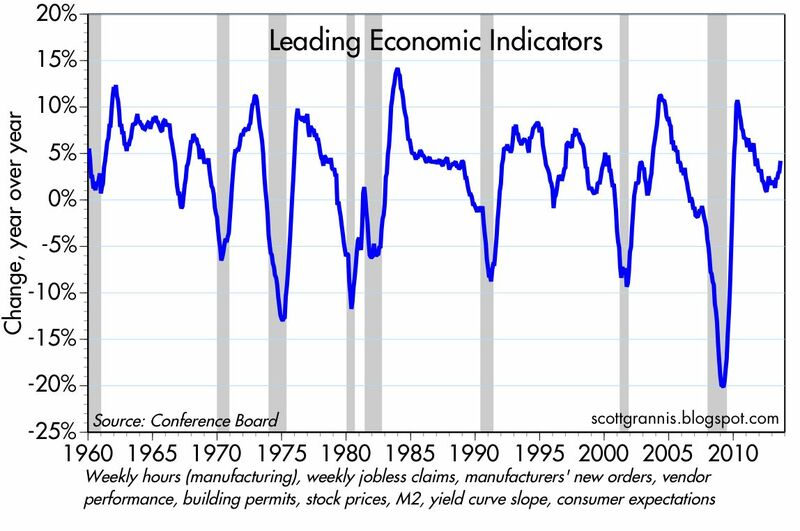 They may not be very leading, but they have consistently turned down during every recession and risen during every growth cycle. As of August, they were up over 4% from a year ago, and that is consistent with a growing economy and very little chance of recession. The chart above shows the level of the index, and I have highlighted how similar the past 13 years have been to the period from 1965 to 1982, during which time the stock market suffered from miserable performance, falling 62% in real terms (see chart below). 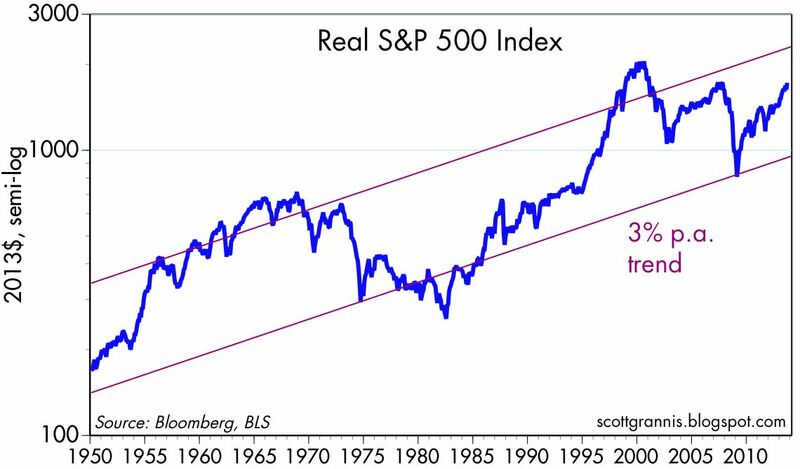 It's been a miserable recovery this time around, but the stock market is in much better shape, perhaps because we have not had a big problem with inflation like we did back in the 1970s. 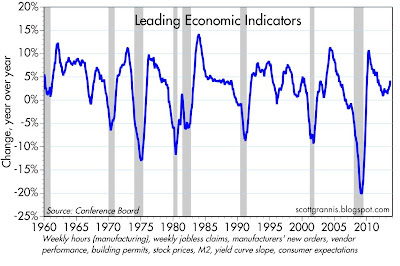 All in all, it looks like economic conditions are gradually improving. 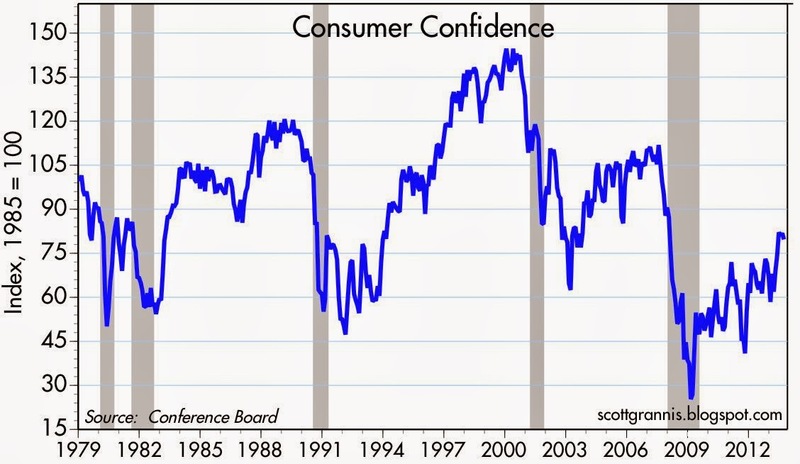 All that's needed to convert this miserable recovery into a robust recovery are more "animal spirits." Businesses need to regain more confidence (so that they are more willing to invest in new plant and equipment and hire more workers), and a good way to help businesses regain confidence would be for regulatory and tax burdens to be lightened, and for monetary policy to become more rules-based. We're leaving paradise today, so in the absence of time I offer this chart which makes a statement about the level of inflation and interest rates over the past decade. Inflation and inflation expectations are one of the most important determinants of interest rates. From 1993 through early 2011, Treasury yields tracked core inflation quite closely, and interest rates were always somewhat higher than inflation, just as theory would predict. But from early 2011 through April of this year, that wasn't the case: interest rates moved down while inflation rose, and interest rates fell below the level of inflation (and real interest rates entered negative territory). Most observers seem to believe that interest rates were abnormally low because of the Fed's QE program. 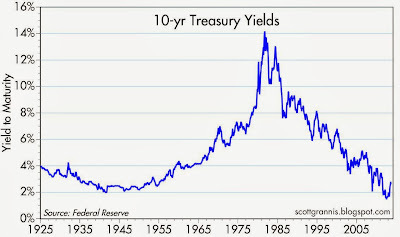 But as the chart above shows, interest rates actually rose each time the Fed bought large quantities of bonds. I've argued that interest rates fell to unusually low levels because the world expected U.S. economic growth to be very weak, and feared that another recession was on the horizon. Interest rates have moved higher of late because the outlook for the U.S. economy has improved somewhat. The recent jump in rates appears to be the first step in restoring the normal relationship between interest rates and inflation. 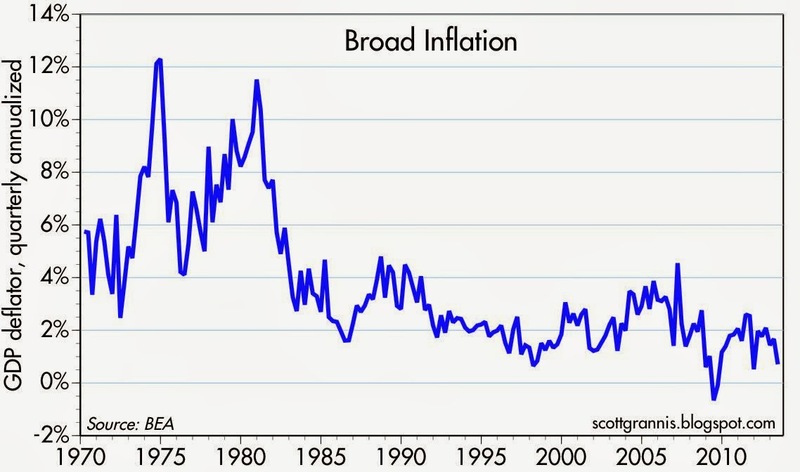 Rates are still relatively low, however; if inflation remains at current levels and the economic outlook continues to improve (e.g., the market begins to price in growth expectations of 3% or better), then short- and intermediate-term interest rates should and could rise by another 100 bps. 10-yr Treasury yields could rise by another 50 bps or so. I first introduced this chart a few months ago. I think it's a good way to track the world's demand for safe assets. Gold is the classic "safe asset," being both durable and traditionally a refuge from monetary and political risk. 5-yr TIPS are also a "safe asset" since they are default-free, their price is relatively stable, and they offer protection from inflation. 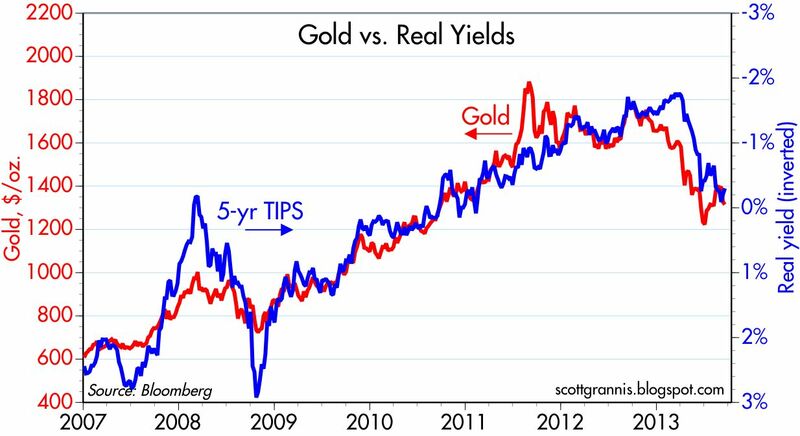 As the chart shows, the real yield on TIPS has correlated inversely with the price of gold for most of the past six years. 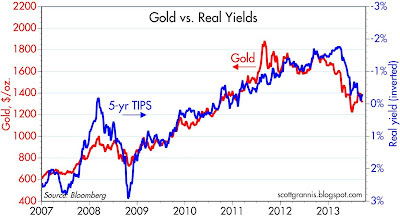 (Another way to say this is that the price of TIPS, which moves inversely to their real yield, has correlated positively with the price of gold.) Both prices have been moving down of late, which I think tells us that the world's demand for safe assets is beginning to decline, after having risen substantially for more than 5 years. If gold and TIPS are at the cutting edge of the demand for safe assets, then they could be leading indicators of the demand for other safe assets, such as cash, currency, bank savings accounts, and short-term bonds. So far, there is little, if any, evidence that demand for these other safe assets is declining. 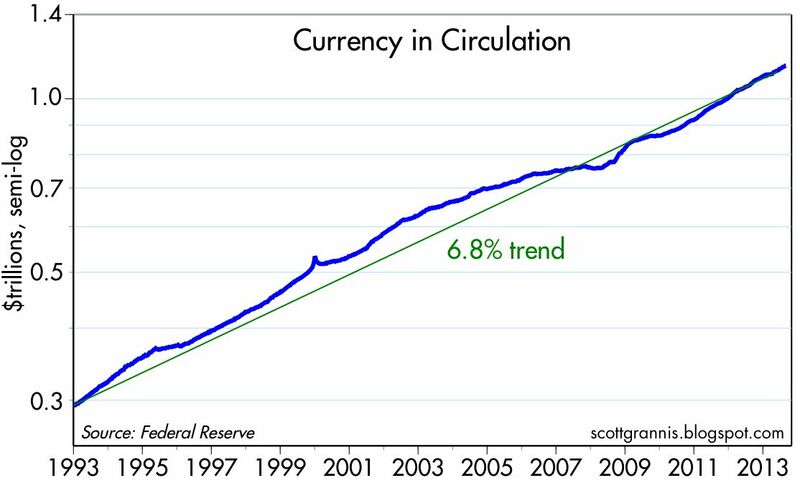 U.S. currency in circulation is growing at about a 7% annual rate, or about the same pace it's averaged for the past 4-5 years. There's no sign of any slowdown in the growth rate of currency, and I note that the world's demand for dollars has been relatively stable over this same period. 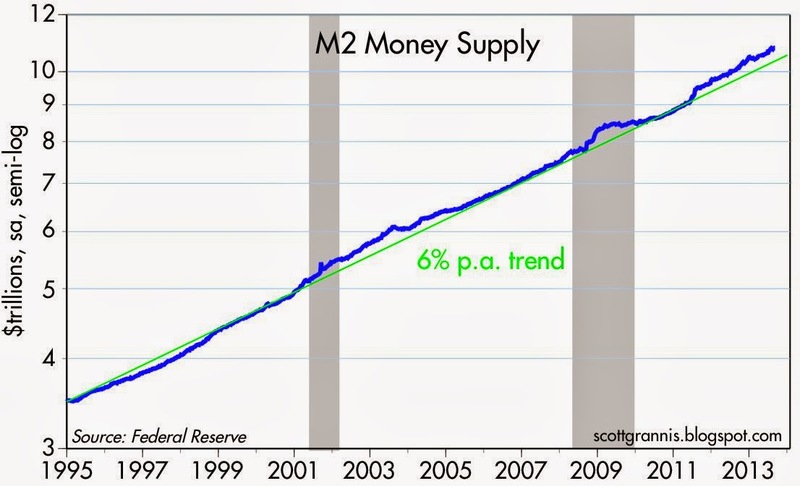 Similarly, there is no sign of any slowdown in the growth of M2, arguably the best measure of "money." 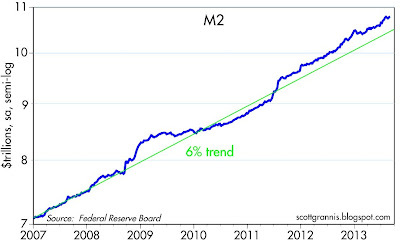 For the past two years, M2 has grown at a 6.5-7% pace, which is only slightly above its long-term average. Bank savings deposits have been growing at an 11-12% annual pace since the Lehman crisis in Q3//08. The pace of growth has slowed a bit in recent months, but is still relatively strong at 9-10%. Demand for the safety of bank savings deposits is still strong. 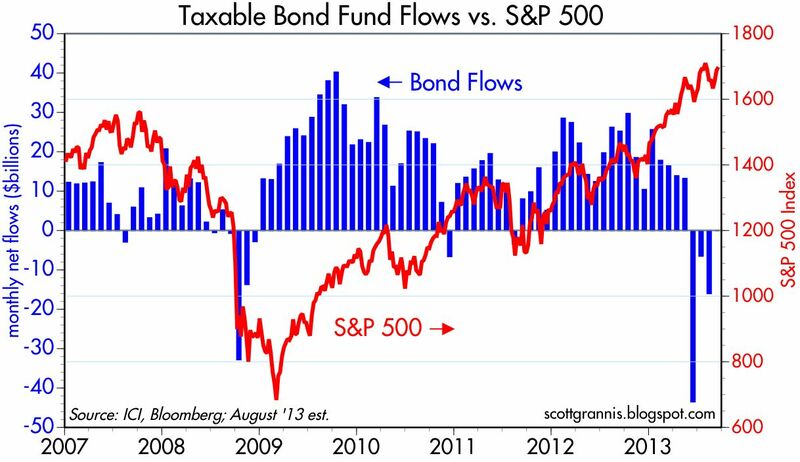 After four years of strong and virtually uninterrupted gains, taxable bond funds have experienced significant outflows in the past several months. This is a sign that the world is less anxious for the relative safety of bonds, and this reinforces the message of TIPS and gold. To judge from this collection of charts, any decline in the world's demand for safe assets is still in its early stages. This is the reason that blogging has been light this past week. We're at our favorite spot in paradise: the Napili Kai Beach Resort in Maui. 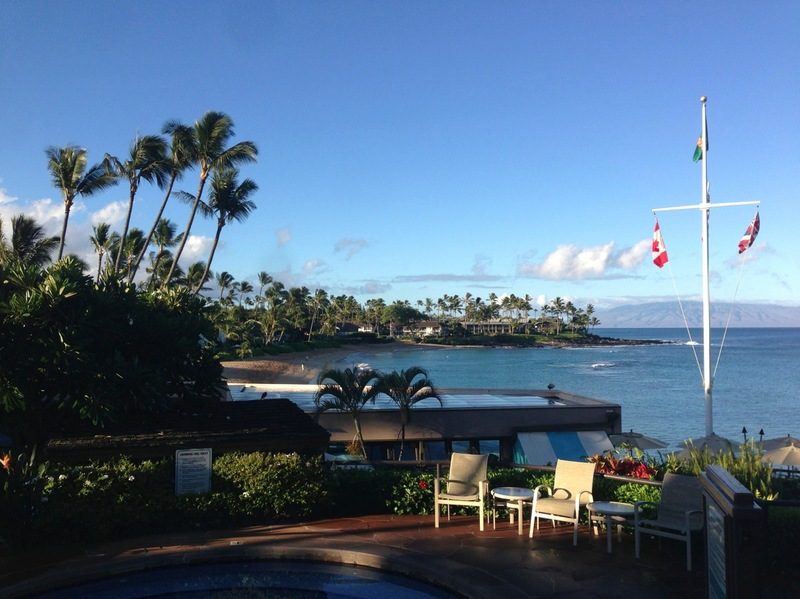 Their motto is "the unhurried way of life," and indeed it's hard to do anything but relax and enjoy the beauty. Since hitting a high of $1.478 trillion in February 2010, the U.S. federal budget deficit has plunged by 54% to a new, post-recession low of $679 billion in the 12 months ended August 2013. 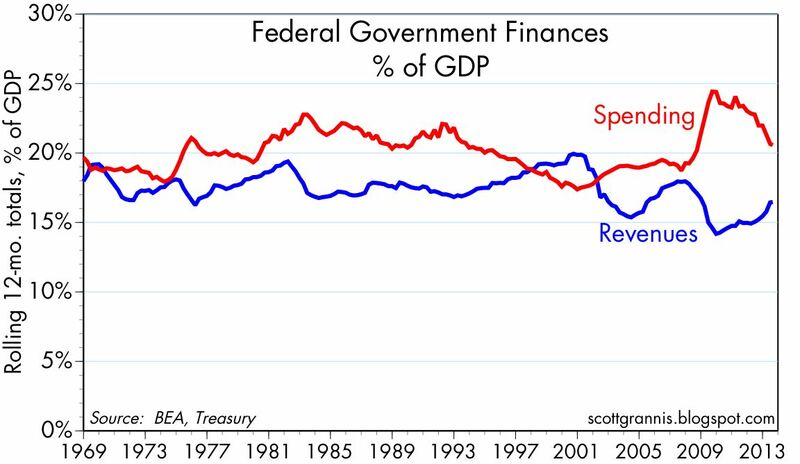 Two factors accounted for the bulk of the decline: federal outlays have declined (both in nominal terms and relative to GDP) and revenues have grown. Virtually no one expected the budget outlook would improve so quickly and so dramatically. Since the decline in spending is without post-war precedent, whereas the rise in revenues is fairly typical of recoveries, the real surprise here is the degree to which spending has declined. 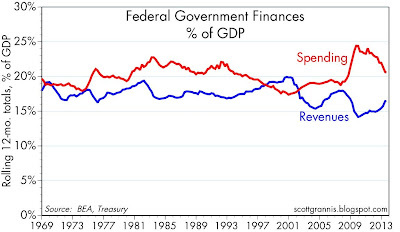 As the chart above shows, there has been no growth in federal spending since the recession ended in mid-2009. 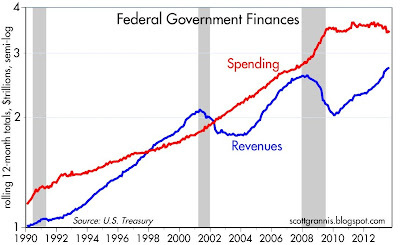 Federal revenues, on the other hand, have been rising almost continuously since late 2009. Relative to GDP, spending has declined by over 15%, from 24.4% of GDP to 20.6%, while revenues have increased by almost 17%, from 14.2% of GDP to 16.5%. The budget deficit is now a mere 4.1% of GDP, down from a high of 10.2%. In less than 3 years, the federal budget outlook has gone from dire to almost normal. It's nothing short of astonishing. It's tempting to conclude that the massive fiscal "stimulus" of 2009 was bad for the economy, while the unwinding of that "stimulus"in recent years has been good. (We can't know for certain, of course.) 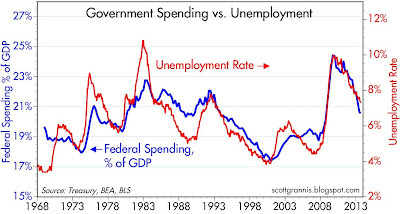 But at the very least, this is a very important example of the Law of Unintended Consequences, which loves to thwart the best intentions of politicians: government spending doesn't always do what it is expected to do. As I've explained before, this is very good news. As Milton Friedman taught us, spending is taxation, so the big decline in spending means that the expected burden of future taxation is far less today than it was thought to be just a few years ago. This is equivalent to a dramatic reduction in the headwinds facing the economy. It's also a big reduction in the level of uncertainty that has plagued the economy for the past several years. In a supply-side model, this is a good reason to be optimistic about the future, since declining tax burdens and reduced uncertainty should prove to be fertile ground for much-needed new investment. It may be too much to hope for, given that the healthcare exchanges are supposed to open for business in less than 3 weeks, but I continue to believe that Obamacare will never see the light of day. It's terribly unpopular, more and more unions are against it, the exchanges aren't ready, and the deferral of the employer mandate opens the door to massive fraud unless the individual mandate is also postponed. Even if the exchanges open and the individual mandate takes effect on January 1st, it is inevitable that Obamacare will fail to achieve its objective, all the while creating unpleasant and unintended consequences for tens of millions of citizens. From the very beginning, it was clear that there was almost a zero chance that the government could re-engineer and restructure one-sixth of the U.S. economy in a way that would work to the benefit of the majority of the people. It was hubris to the max, and as such, virtually guaranteed to fail. If the implementation of Obamacare is delayed, this would result in another boost (by reducing expected tax and regulatory burdens) for the U.S. economy.